(Nanowerk News) Researchers at the University of Maryland have invented a single tiny structure that includes all the components of a battery that they say could bring about the ultimate miniaturization of energy storage components. The structure is called a nanopore: a tiny hole in a ceramic sheet that holds electrolyte to carry the electrical charge between nanotube electrodes at either end. The existing device is a test, but the bitsy battery performs well. First author Chanyuan Liu (from materials) says that it can be fully charged in 12 minutes, and it can be recharged thousands of time. Chemists and materials scientists collaborated on the project: Gary Rubloff (MSE, ISR, IREAP and Maryland NanoCenter), Sang Bok Lee (Chemistry) and their students. 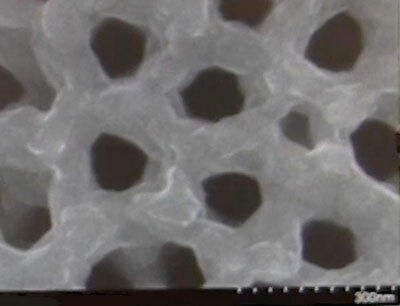 Many millions of these nanopores can be crammed into one larger battery the size of a postage stamp. One of the reasons the researchers think this unit is so successful is because each nanopore is shaped just like the others, which allows them to pack the tiny thin batteries together efficiently. 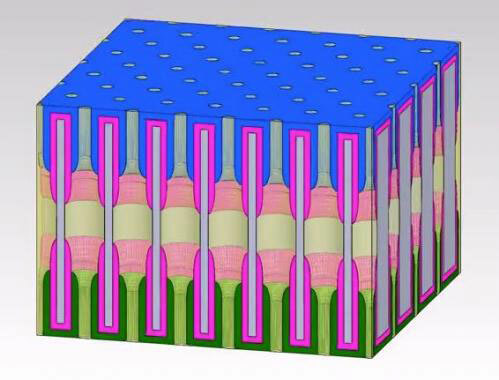 Coauthor Eleanor Gillette’s modeling shows that the unique design of the nanopore battery is responsible for its success. The space inside the holes is so small that the space they take up, all added together, would be no more than a grain of sand. Now that the scientists have the battery working and have demonstrated the concept, they have also identified improvements that could make the next version 10 times more powerful. The next step to commercialization: the inventors have conceived strategies for manufacturing the battery in large batches. The research was funded by the Department of Energy. It will be published on November 10 in the journal Nature Nanotechnology ("An all-in-one nanopore battery array").